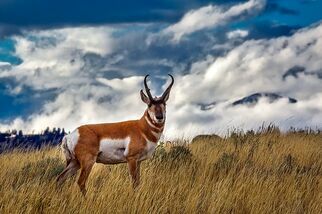 With the largest concentration of mammals (over 60 species) in the lower 48 states and over 150 species of birds nesting in the park, you will be treated to an incredible diversity of wildlife when you visit Yellowstone National Park. Other species you may spot during your time in Yellowstone include trumpeter swans, red fox, otters, badgers, golden eagles, loons, and countless numbers of amphibians, reptiles, and fish. The list can continue on too! Where to find wildlife in Ye‍‍llowstone? 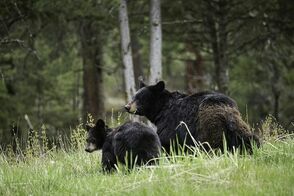 Some examples of wildlife you'll find in Yellowstone National Park include bison, wolves, moose, elk, pronghorn sheep, bighorn sheep, and the elusive black and grizzly bears. While most of these animals can be found in Lamar Valley (when the timing is right‍‍), if you don't have much luck there you can head a bit farther south in the park to Hayden Valley. Here you will can be treated to huge herds of bison and rolling hills, making for some delightful photo opportunities. So how close do the animals get? Often times huge traffic backups will occur when a large male moose or a family of bears is spotted along the road. If you find yourself in one of these situations please find a safe place to pull over and don’t block traffic. Remember that the animals are wild, so staying in your vehicle is always the best idea. You never know when an animal may decide to head in your direction. No one needs to be in the path of a Bison! To best way to enjoy all this wildlife is definitely by bringing a pair of binoculars. Even better if you have a spotting scope, this will allow you to often see wildlife that few others can see. Rest assure, if you join a guided hiking tour of Yellowstone National Park your guide(s) will always come equipped with the proper equipment. Being on a guided experience is all about making sure you have the best wildlife experience while travel details are completely taken care of for you. How much wildlife can be found in the park? Keep in mind that sometimes you just won't see many animals though. There are a number of factors at play here like time of day, time of year, noise from other curious on-lookers, and your patience level. Who can think of a more relaxing day than walking around Yellowstone on the look-out for a herd of bison though?! Black Sheep Adventures has ‍the experience and knowledge to guide you through an exceptional tour experience in Yellowstone National Park. Our passion for our U.S. National Parks is unmatched. Our attention to detail is second to none. 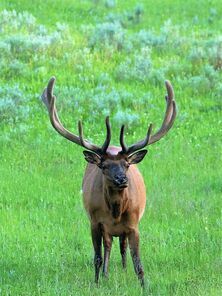 Join us on a guided Yellowstone National Park wildlife hiking experience. While both Hayden and Lamar Valleys are typically the hot spots for wildlife viewing, you certainly have other opportunities all around the park. 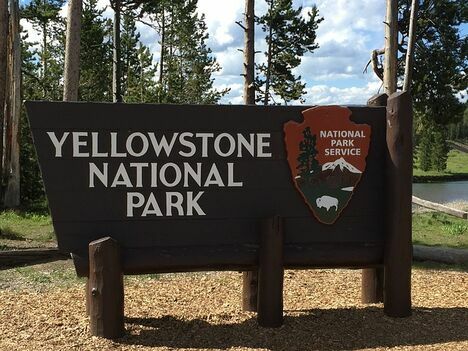 Yellowstone National Park has so many thermal features, rivers, forests, and vast backcountry areas. There is ample space for wildlife to be found throughout the park. Written by Black Sheep Adventure's National Parks Guru, Ben Sander. Ben has been to the majority of the big National Parks in the U.S. and will eventually make to all of them (and so many more). Ben loves hiking with his dog Vita and finding waterfalls anywhere he can.